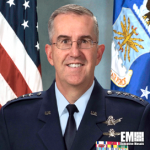 Air Force Gen. John Hyten, head of the U.S. Strategic Command, has said that Stratcom is focused on strategic nuclear deterrence efforts and on the delivery of a response in case deterrence fails, DoD News reported Wednesday. Hyten told the audience at the Hudson Institute that the command is also focused on maintaining a “combat-ready” force to carry out the strategic deterrent mission. The commander added that adversaries might extend attacks to space if a war breaks out, and that he may not recommend a space-based response to the president. Hyten said that a response in space may not be in the best interests of U.S. and that he will suggest a strategic response instead.